Fly anglers are known for their love of “matching the hatch”. This tendency is, of course, connected to fly fishing’s close development with insect hatches over the centuries. There are definitely times when a detailed PMD is the right fly for the job, but we need to pause and remember that the fly is sitting still on the surface of the water. On the other hand, flies that require movement have a different, and I would claim wider, range of factors that contribute to their effectiveness. Despite this, there is often still a huge emphasis on getting a minnow pattern as close to the natural as possible, as if eyeballs, gills, and scales are critical for the success of the fly. Once again, match-the-hatch flies have their place with certain species of fish, but in the majority of cases, the realism of a fly in your hand or in the vice is the wrong approach. Think about a fish’s environment. Take a largemouth bass for example. The largemouth bass sees hundreds, if not thousands, of sunfish and bluegill all day long. The largemouth doesn’t just gulp down every bluegill it comes across. However, if a certain sunfish moves erratically or appeals to the largemouth’s killer instinct, then the largemouth is much more likely to attack the bluegill. Realism has very little to do with that largemouth’s striking of that bluegill. It’s the triggers. 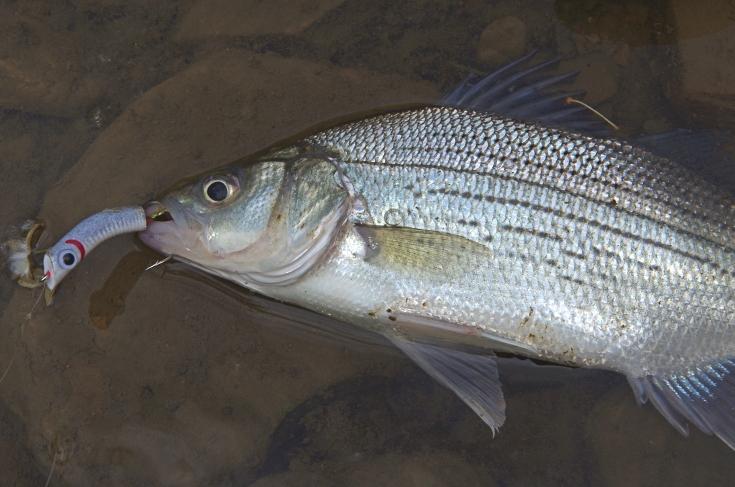 Triggers appeal to the full range of the fish’s instincts, not just hunger. 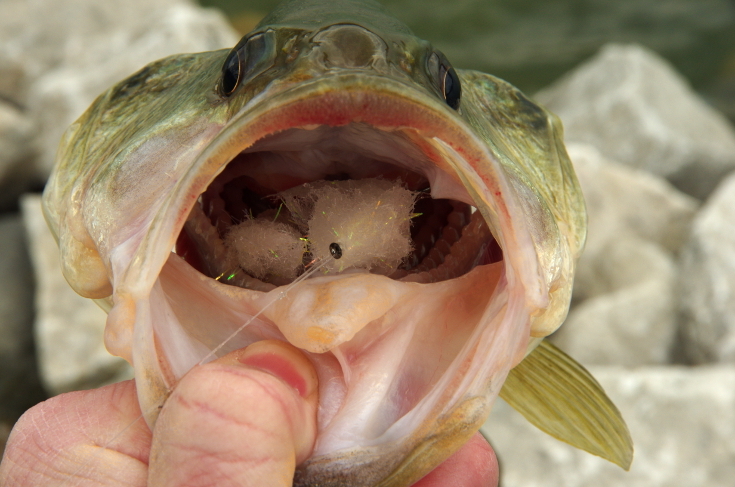 Even when a fish is stuffed, it will eat a fly that uses a trigger to induce a strike. For this reason, as fly anglers, we need to move farther away from the match-the-hatch mentality alone and move toward putting more stock in the triggers of our streamers and baitfish patterns. One of the top triggers is fly action. 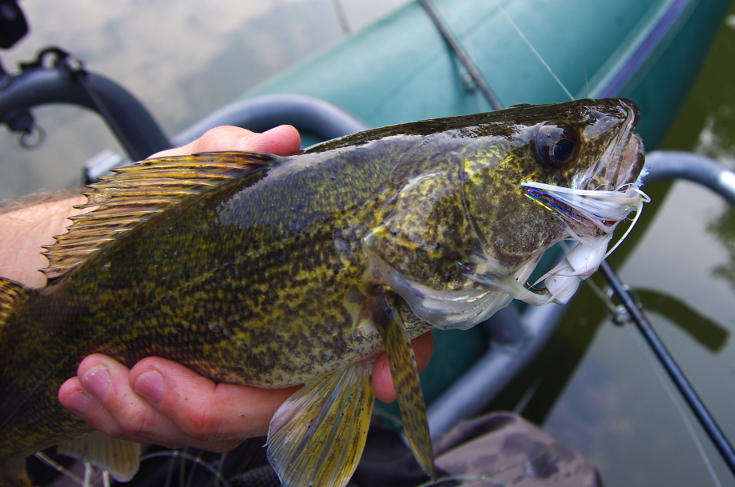 If you think about the dozens of most successful lures out there, the majority of them are not match-the-hatch style lures. They are impressionistic with particular, unique actions. The most unique and innovative fly patterns have almost always been developed in light of a lure, and although flies are particularly effective when direct imitation is necessary, we can improve our flies and make our fly selection much more deliberate when we focus on action. It is important to understand that the trigger, action, is separated from other triggers like vibration and sound. These two triggers come, first, in the form of huge musky flies or even bulky sculpin head fly patterns that push more water than other patterns and, second, in the form of poppers, gurglers, rattle flies etc. Although these characteristics contribute to the overall effectiveness of particular patterns, it is helpful to separate these from action itself. As far as action is concerned, to simplify things, we can consider 8 main types of action. With these specific actions, there are also many nuances, and certain patterns can have multiple action characteristics. For example, you can have a fly that moves side-to-side but that hovers on the pause. By focusing on these specific action qualities, we can change flies in a more methodical manner as we try to establish what is triggering the fish on a given day. The following flies move more or less from least to highest amount of action. I refer to flies that have very little action outside of what you impart to the fly with the term “profile action” or “profile flies”. The quintessential profile fly is a narrow Enrico Puglisi baitfish pattern but also the Gummi Minnow. These patterns provide exceptional profile and lifelike appearance but do not have much inherent action or motion built into them. In certain situations, this profile or close baitfish appearance is critical to success, and in others, it is only effective if you somehow impart action to it. The materials that these flies are tied with do not collapse normally, and, therefore, the pattern keeps that important profile even when you strip the fly through the water. These flies are much more common for saltwater and warm water species, although profile flies are sometimes preferred for certain swinging situations also. Flies that are true profile patterns are pretty uncommon in cold water situations. Some common strengths with these flies are that they are easier to cast, provide exceptional baitfish imitations, have countless color schemes, work great in match-the-hatch situations, and can be used on a huge variety of unique profiles, such as very thin and very wide in diameter. However, the overall action of these flies is the lowest of any action. Inherent motion is the action or movement that occurs when your fly is at rest. There are many different patterns that have amazing inherent motion qualities, but some main types are shrimp and crab patterns, bass flies, and carp flies. Some examples of materials that are fantastic for these types of flies are marabou, arctic fox, Finn raccoon, craft fur, rubber legs, and bunny fur. These materials will ungulate with the slightest movement you or waves might impart to the fly. With many fish species such as bonefish, carp, permit, bass, and even northern pike in some situations, sudden movement will scare the fish. Your fly needs to have inherent motion to keep the fish interested. These fish will sit and look at your fly, sometimes for minutes, just waiting until they can’t take it any longer. There are times when this type of action is the only thing that will entice a fish to eat, but it’s as deadly a trigger as there is, particularly when fish are neutral or inactive. To encourage this action, very tiny and quick strips or micro shakes will cause the fly to almost vibrate. If you are having trouble getting fish to commit, try this to push them over the edge. FLIES LIKE THE HOLLOW FLEYE WILL HOVER, TEMPTING NEUTRAL OR INACTIVE FISH. The hover action has more to do with weight than anything but also with the materials that you use to achieve near or actual neutral buoyancy. Flies that hover will normally have a very slow sink but can also remain in place for 10 to 20 seconds if necessary. 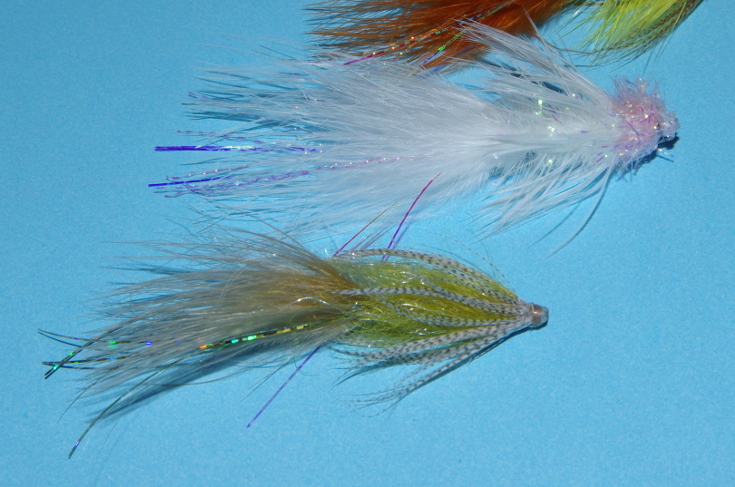 Examples of flies like this are the Tarpon Toad and flies tied with bucktail such as the Hollow Fleye and Bulkhead. Other types of flies will be made of foam and be fished with a sinking line. The fly will sit off of the bottom and hover or rise slightly on the rest. Examples of this are the Booby Fly and divers fished deep on sinking lines. These flies are similar to inherent motion flies and may actually have inherent action as well if tied with similar materials. These flies incorporate a little more action into the fly than do flies that sit on the bottom of the lake, river, or flat and are often accompanied with other triggers such as vibration with patterns that push water. Similarly to patterns with inherent motion, this action is best fished for specific species that love this type of tantalizing action or fish that are neutral or inactive. Examples of fish species might be tarpon, snook, bass, trout in stillwaters, pike, and musky. Drifting and swinging is an action of sorts, but this is more due to the type of presentation than to the actual characteristics of the flies. Most flies can be swung. However, there are certain movements that excel during a drifting or swinging action. First, skated dry fly patterns produce a characteristic V-shape on the surface. Examples of these patterns are mouse, steelhead, and Atlantic salmon skating patterns. To label other patterns as “swinging” patterns or patterns having a “swinging action” is difficult, since sometimes you want a strong profile and other times you want inherent action. Other times, you want other types of action. In this light, you might only consider these skating/waking flies as having a swinging action. Despite this, flies meant for swinging are often tied with materials such as rhea, ostrich, arctic fox, and marabou, similarly to flies with inherent action. Flies that have the “tail flicker” action have very little motion except for the tail. Many, many fly patterns fall under this type. 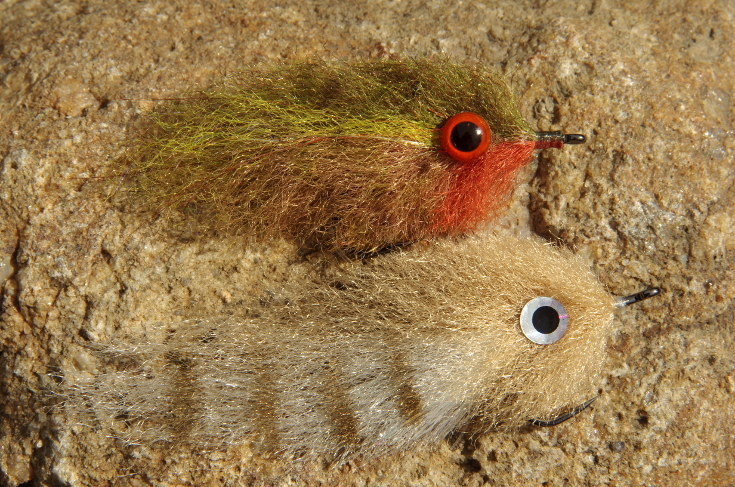 Among them are the Woolly Bugger, Zonker, many different tarpon and snook flies, bunny leech, Meat Whistle, Double Bunny etc. This action is a step up from the “profile action” but can still provide a strong profile in many cases. However, patterns with this action will flip and move in current much better than do patterns with a profile action. There may also be a bit of weight in the head of the fly to give the tail a bit of movement on strips, and the fly will have a tendency to collapse a bit in the current or on the strip and then move back on the pause a bit. Flies with this action are normally tied with soft materials for the tail such as marabou, fox, bunny, and craft fur. Flies with the tail flicker action are a step up from profile patterns in overall action and are also normally better for most moving water situations unless a strong profile is hugely important. These flies also have a tendency to do better when fished a bit slower than flies with a profile action and are more or less the counterpart to profile action in cold-water situations. VERTICAL ACTION WILL ATTRACT A LARGE VARIETY OF FISH. Flies with vertical motion action trigger through vertical movement. Two prime examples are the Clouser Minnow and the Bottoms Up streamer pattern. Flies with vertical motion are almost always weighted, but a few flies have deep cut deer hair heads that cause the fly to jump up and down vertically in the water column. 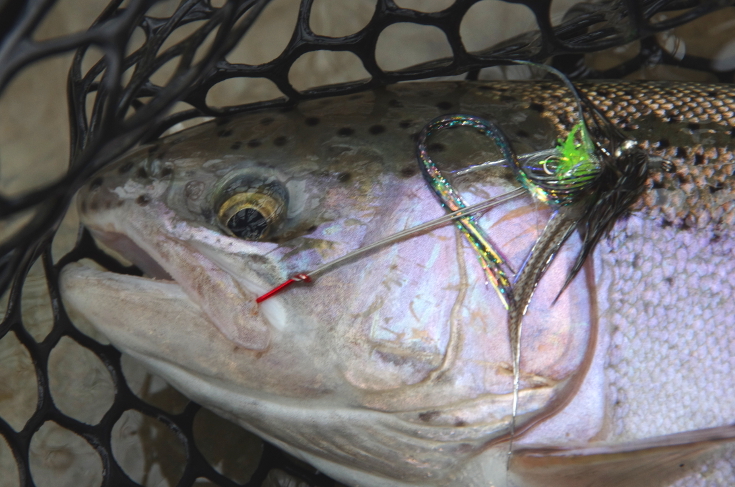 Flies with this action are often considered “jig flies”, since they have a similar trigger to a jig. That’s not to murky the nuances that many of these flies have, and these flies can be worked in a lot of different ways even if their inherent nature is to provide movement in a vertical motion. 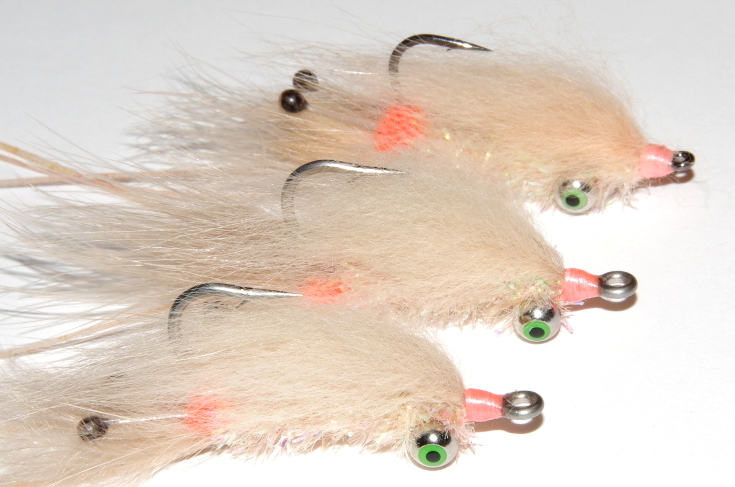 With one working method, these flies can shoot up quickly and then fall to the bottom again just like a jig. 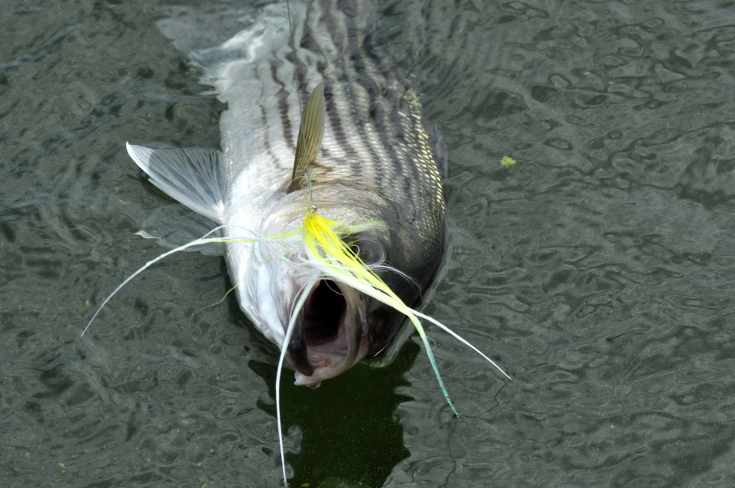 This type of action is also typical with some lipped flies that are allowed to sink to the bottom. A sharp strip causes these lipped flies to jump up into the water column vertically. The fly then sinks to the bottom and might even rest there for a bit. These flies can be retrieved horizontally with pauses that cause the tail to shoot up and the head to move down almost like a lopsided seesaw. A skilled angler that understands these flies can also impart many different motions throughout the retrieve, and these flies are much more efficient to fish when you need to get down in the water column. The weight allows you to cover water more quickly and thoroughly but can also hinder casting especially with a really heavy fly. More weight can also spook fish in certain skinny water situations, and once you add enough weight, the fly gets closer to a lure in its commotion when entering the water. In this respect, you lose some of the characteristic weightlessness of fly patterns that can really be so important in calm fishing conditions. This retrieve, almost more than any other, can really lead to a reaction strike. A prime example is with silvers and pink salmon when you attach a heavily weighted fly to a floating line. The angler then makes a sharp and deliberate strip on the line to shoot that fly forward which then drops after the strip. Even when fish are neutral they are drawn to this type of action. The side-to-side action is found in a ton of different flies, which move horizontally in different manners and speeds. Strictly speaking, the fly doesn’t actually have to travel back and forth/side to side; the fly might twitch two or three times on one side and then move to a back and forth action. The majority of flies with this action, however, have a natural side-to-side action. The fastest version of this action is when flies are ripped through the water with a constant wiggle motion much like a crankbait in general tackle parlance. There are a lot of patterns out there that can imitate this movement very effectively. Some prime examples are flies with plastic lips or with discs on the front of them. These plastic attachments walk the line between general and fly fishing, but in many respects the discs open an avenue that may drastically alter our ability to modify fly action, sound, and vibration in the future. Next, would be the foam wiggle flies. These flies also allow the pattern to move vertically on the pause, i.e., they float like a floating Rapala when at rest, but dive down a few feet when stripped. Alternatively, you can fish these patterns with a heavy sinking line to fish them a few feet off of the bottom. Other patterns such as the Double Deceiver will move back and forth with a little slower rhythm, but still with the characteristic back and forth horizontal action. Other flies like the spoon “fly” will have a wobble as they are moved through the water, which is a more subtle action than the other examples. Finally, you can have flies that will move horizontally side-to-side at a much more methodical and even dramatic rhythm. Flies such as the Murdich Minnow, when tied with a large head, will move side-to-side with a slower cadence than the wiggle flies. You can work this fly, trying to trigger that smallmouth to punish the fly on the pause, punctuated by a methodical side then side action. Other flies that perform a similar movement are Hollow Fleyes and Bulkheads. Depending on the density of the materials, the fly may more glide than shoot from side-to-side. Many musky flies also produce a similar action. These flies are extremely versatile. The first group, which requires more or less constant movement, can be fished when you need to cover water. You can choose a wiggle fly that moves extremely fast from side-to-side, similarly to a lipless crankbait, or you can fish a fly like a double deceiver which will wiggle with its articulation with great displacement in the water. The fly will almost resemble a snake with how far it moves back and forth. You can also slow these flies down to a moderate pace. If you need to work fish a bit more, you can use the flies that twitch back and forth and seemingly hover in the air or drop slowly. This last group can absolutely trigger neutral or lethargic fish, but active fish will destroy your fly as well. The horizontal action is extremely effective, versatile, and fun. Always have flies in your box that have this action, and even different versions of this action. This final action, “erratic”, is a catchall of sorts. It really encompasses flies that inherently break both the horizontal and vertical plane. Many flies that produce a side-to-side action will actually allow you to produce more erratic action in your fly pattern if you change your retrieve and/or rod movement. An example of this is the Murdich Minnow, which will allow you to twitch and pulse the fly up and down and with a very erratic movement. The fly can also fall similarly to a vertical action and then come to life and go into a side-to-side action. Flies that are a little more inherently erratic in their action are the Drunk and Disorderly and the Game Changer. The D&D is more subtle than the Game Changer in this respect, but it still allows you to produce incredible, erratic action, breaking the vertical and horizontal planes with every strip. The Game Changer is one of the most erratic fly patterns ever designed. The fly breaks the planes and can sink or move with a jerk motion and then be popped up so that the tail will flip to the front. This type of action drives predators insane. The beauty about these flies is that they are versatile and work on fish that are not necessarily hungry. The flies trigger these fish into feeding; the fish can’t help themselves because of the millions of years of evolution. The real strength in these flies is normally in the angler’s ability to work the fly. You can experiment if the fish are sluggish by letting the fly sink with a methodical twitch-twitch, or you can really move that fly erratically and swiftly, trying to really stir that fish up. These flies are indispensable to anglers, and almost every type of predatory fish will eat flies with this action. No system of classification is perfect, but these guidelines help us choose and design flies with a purpose. If you have flies that only cover one major type of action, you’re not going to catch fish as consistently, particularly in dozens of different water systems. If you fish one body of water, you might have discovered a particular action that is consistently effective. That’s great! Just don’t expect that to be the case everywhere you fish. Also, there is some beauty in the versatile fly. Many of the best patterns allow you to modify their action when you adjust how you are working the fly or by modifying your rig, say by adding split shot. Versatile flies help you to simplify things even further, so never underestimate these types of flies. Now, once you have your fly actions covered, you can add in other triggers such as sound, vibration, color, flash. Each trigger is important, but for my money, the most drastic change in success will most often come from action. Notify me when I receive a reply. IMPROVE YOUR FLY FISHING TRAVEL EXPERIENCE! GET ARTICLES, VIDEOS, & PODCASTS FROM TOP ANGLERS FIRST. FLY FISHING FROM ALASKA TO THE BAHAMAS. WE JUST MET, BUT WE'D LIKE TO GIVE YOU ALL OF OUR ARTICLES, VIDEOS, PODCASTS, EBOOKS, AND EXTRAS FOR FREE!